A beautiful sovereign island country with historic sites like ‘The Moeraki Boulders’ & ‘Craters of the Moon’. The ‘Kowhai’ is usually regarded as the national flower of NZ. Invited to a Kiwi's house, don’t forget to gift a small bunch of flowers, chocolates or a book. Ideal choices are Roses, Lilies, Tulips or Orchids. Send flowers same day to New Zealand using our local florists & flower shops. Order by 12 noon. Send Mother's Day Pink Roses, Lilies, Carnations & Special Gifts to New Zealand. Send Roses, Carnations, Lilies throughout New Zealand for occasions like Birthdays, Anniversaries, Funerals, etc. Enjoy affordable flower delivery across Auckland, Manukau, Wellington, Christchurch & nationwide delivery. 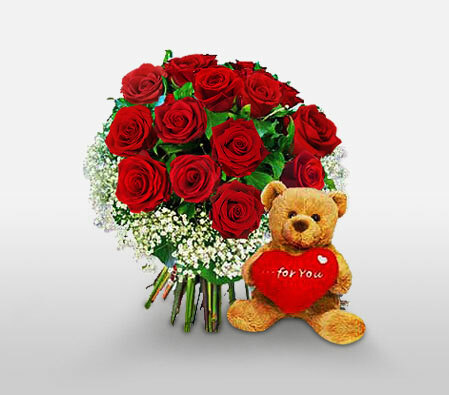 A luxurious display of extravagance for that special someone conveyed through this exquisite combination of an adorable teddy bear and a bouquet of 12 romantic roses surrounded by babys breath. Approximately 12 inches W x 18 inches H.
How do i send International Flower Delivery to New Zealand? 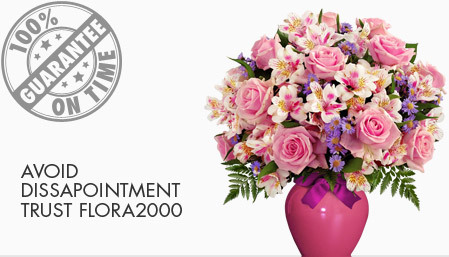 Flora2000 has transformed International flower delivery to New Zealand into a fine and effortless art. With our efficient flowers & gifs delivery services worldwide; you are sure to find the perfect expression of your message to your loved ones. Be it Roses, Lilies, Carnations or Cakes, our gifts are sure to make both the sender and the receiver happy. We make sure the gifts you give reflects what you feel about the receiver. A beautiful sovereign island country in the southwestern Pacific Ocean comprising of 2 main landmasses The North Island & South Island & showcasing iconic & historic sites like the Moeraki Boulders & Craters of the Moon. The Kowhai is usually regarded as the national flower of NZ. Send fresh flowers and gifts on-time from Flora2000.com to show your love from Wellington to Nelson and Auckland to New Plymouth that will make any Kiwi smile. Invited to a Kiwi's house, don’t forget to bring a small gift such as flowers, chocolates or a book. Handpicked Unique Gift Ideas for Mom. Fresh Roses, Lilies, Carnation & Gift Hampers specially crafted for your mum. Order NOW for guaranteed delivery on Mother’s day in New zealand.